On Wednesday, Russ Rose said in an interview that the thing he remembered from Penn State’s 2011 season opening loss to Oregon was that the Nittany Lions won the statistical battle, but lost the match. 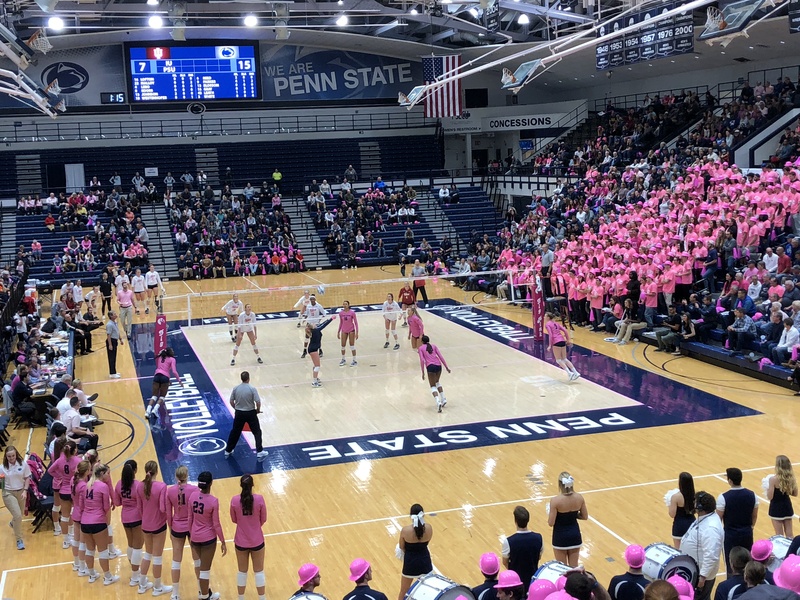 This time, with the exception of blocking (Penn State totaled 19.5 blocks to 10.0 for the Ducks), Penn State lost both, as Oregon defeated Penn State 3-1 (25-21, 28-30, 22-25, 19-25), with the Oregon hitting .170 to Penn State’s .165, and Oregon totalling 63 kills, six aces and 80 digs to Penn State’s 52 kills, six aces and 67 digs. After starting slowly, 6-4 Jr. Opp/RS Ariel Scott led all players with 18 kill. 6-1 Jr. OH Deja McClendon totaled 14, along with 3 service aces and 12 digs. 5-11 So. S Micha Hancock delivered 45 assists and 12 digs (and was out with an injury of some kind in the second set for a number of points. After reentering the match, she couldn’t jump serve). 5-6 So. L Dominique Gonzalez topped all players with 22 digs. 6-2 Fr. OH Megan Courtney and 6-6 Jr. MH Katie Slay tied for the team lead in blocks with 8 each. We knew Oregon was a very good defensive team, but their defense really was extraordinary, as was their passing. Lauren Plum and Alaina Bergsma were as good as advertised. Looking ahead, Penn State returns all its starters (four of whom earned AVCA All-American honors in 2012). But that’s next year. There’s no getting around the fact that 2012 ended on a disappointing note. Still, we appreciate the hard work and dedication from all the players during the 2012 season. Thanks to all of you.